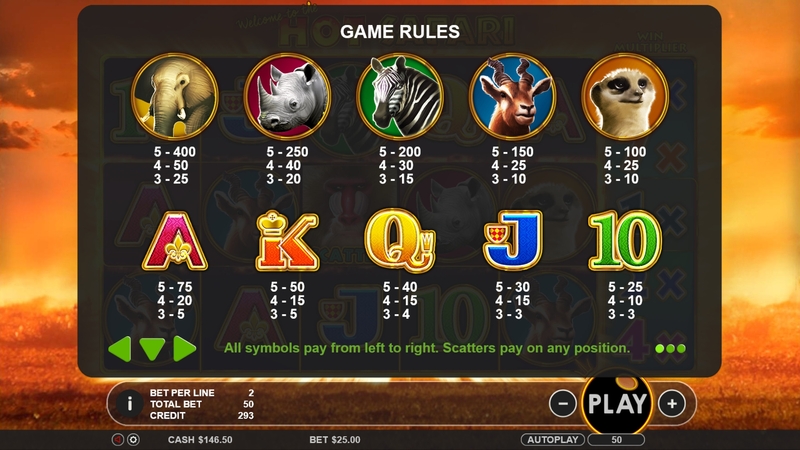 Hot Safari is a 5 to 6 reels and 25 payline slot by Pragmatic Play. It's got a wild animal theme with features on here including expanding wilds, multipliers, respins, a Super Wild Bonus feature, free spins and offers payouts that go up to 4,000x your bet on every spin. Stakes start from 25p to £125 a spin. Check out our top slot sites here. Play more uk slot game now. The game is set in the sunlit plains of Africa. Head on safari in this online slot and catch a glimpse of the beautiful Savannah thanks to the game's visuals. Symbols on the reels include low value playing card symbols as well as a rhino, meerkat, zebra, gazelle and an elephant. When 5 elephant symbols land on a line, you win 400 coins. The lion acts as the wild and substitutes all other symbols except the scatter. Whenever the wild hits the middle reel position, it expands and fills the entire reel. As mentioned earlier, the game has a 5 to 6 reel setup. The 6th reel contains a selection of multipliers ranging from 1x to 10x. Whenever you have a winning spin, the initial payout gets boosted by the multiplier figure indicated on the multiplier reel. Super Wild -There's also a super wild spinning around the 6th reel. When the pointer lands on the super wild, you’ll activate the Super Wild Bonus feature. Here you're awarded a respin plus a wild that’s added to every reel. Just like in the main game, if the wild symbol hits the centre, the wild symbol expands to fill the entire reel. Free Spins feature -If you land 3 monkey scatters, you will activate the Free Spins feature and are awarded 10 free spins. The multipliers come into play during the free spins. You can also activate the Super Wild Bonus feature and activate free spins too (up to 20 spins in total). Your goal should be to land a wild symbol at the centre of every row together with the maximum 10x multiplier. When that happens you will win up to 4,000x your bet. There’s a lot of action offered on here starting off with the multipliers that keep the main game exciting. The Free Spins feature won't be as reliable as you'd hope, but the Super Wild Bonus respins will make up for that. Also if you land those wilds on the middle position and they become stacked, you could win some nice rewards. 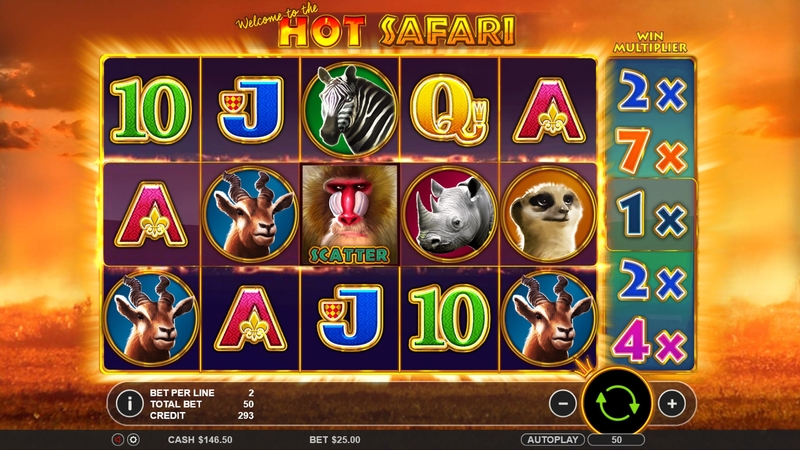 This Hot Safari online slot design isn’t on the highly sophisticated side, but it's got enjoyable gameplay. If you’re lucky, the wilds and multipliers could end up making this your most memorable safari. If you enjoyed Hot Safari why not try another online slot here on EasySlots.com and learn more about how to pay by phone casino.